Federal regulators issued a revision this week concerning prescribing information on all opioids used in outpatient settings. There have been reports about patients who are physically addicted to opioids suddenly ending their drug course or dramatically reducing their dose, which can lead to symptoms as mild as withdrawal to outcomes as serious as suicide. Thus, the FDA issued a Drug Safety Communication in which the agency urged clinicians not to suddenly end opioid treatment or reduce dose levels sharply for patients who are physically addicted. Also, the agency advised patients to consult closely with their healthcare providers when considering ending their opioid treatment so they can do so safely. “These changes will provide expanded information to healthcare providers on how to safely decrease the dose in patients who are physically dependent on opioids. This information is intended to be used when the healthcare provider and the patient have determined together that a decrease in dose or discontinuation of the opioid is appropriate,” Douglas Throckmorton, MD, deputy center director for regulatory programs in FDA’s Center for Drug Evaluation and Research, said in a statement. Factors all parties should consider when discussing altering opioid treatment courses include type of pain treated, drug dose, how long treatment has lasted so far, and the psychological and physical conditions of the patient. The FDA’s label update is just the latest of several federal developments on this issue over the past few weeks. In March, the U.S. Department of Health and Human Services released an additional $487 million to supplement first-year funding through its state opioid response grant program, part of the agency’s Five-Point Opioid Strategy. 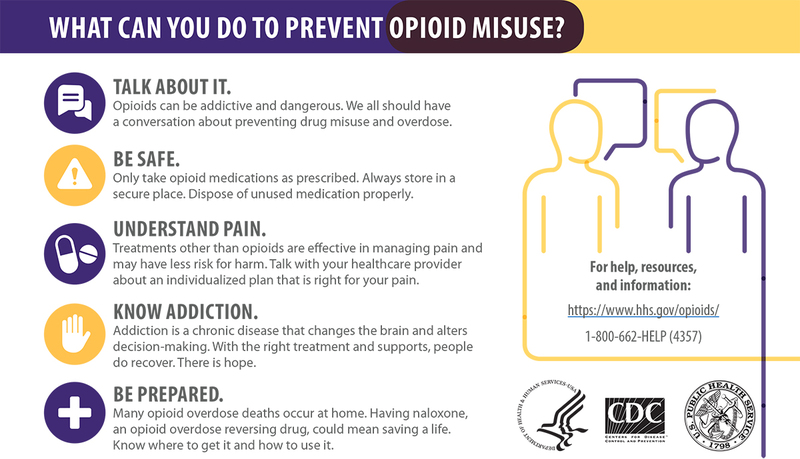 The office of the surgeon general continues offering a variety of tools and resources to help healthcare providers and patients alike, including a new poster targeted to patients specifically. Meanwhile, in the April issue of Healthcare Risk Management, author Greg Freeman noted how opioid prescribing is under intense scrutiny from federal and state prosecutors, creating significant risk for individual clinicians and healthcare organizations. Any high volume of prescribing or other anomaly can trigger an investigation. Thus, it is vital for hospitals to closely monitor prescribing practices. In a recent episode of the Relias Media podcast “Rounds With Relias,” an expert offered information about how to prevent burnout and empower providers treating patients with opioid use disorder.